Pinot Noir by Grasshopper Rock of Central Otago. Smoothly textured palate with ripe tannins in support of red and black currant and plum flavours. Named for a rare grasshopper Sigaus childi, found only at Central Otago within the Earnscleugh gold mine tailings, just across the road from Grasshopper Rock vineyard. Earnscleugh Road is at the southernmost latitude of established wine growing in Central Otago. Rich, generous yet wonderfully integrated on release, a long savoury finish and perfect balance of cherry Pinot acids. From its beginnings, Grasshopper Rock has produced award winning wines. 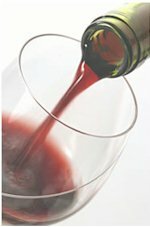 The wine is often selected to showcase pinot noir from the Alexandra sub-region of Central Otago. The 2006 vintage achieved international acclaim when it scored 92 points (outstanding) in Robert Parker's Wine Advocate magazine in 2008. The 2007 vintage is a wine of greater intensity and was awarded three GOLD MEDALS including GOLD at the Hong Kong IWSC. The 2008 vintage has been awarded two GOLD MEDALS including GOLD at the International Wine Challange (IWC) in London and BLUE GOLD and TOP1OO at the Sydney IWC. The 2008 pinot noir is one of the best pinot noir of the vintage for Central Otago and New Zealand. Purchased in 2002, the vineyard at Earnscleugh Road is one of the few large tracts of quality grape land in the Dunstan Basin, which surrounds Alexandra. Within the site, there are three distinct areas: blocks 1 & 2 are hill soils on shattered schist with schist outcrops; blocks 3 & 4 are at the foot of the hill, on loamy sand over schist gravel; blocks 5 & 6 are out from the hill on shallow loamy sand and stony sand on greywacke and schist gravels. The gentle, north facing slope attracts high temperatures and has the potential to produce a unique wine of greater complexity, from the mix of pinot noir clones planted on the different blocks. 38,000 vines were planted on 8 hectares in 2003 and the first vintage was harvested in April 2006. Earnscleugh Road is at the southern most latitude of established wine growing in Central Otago. At 45°15' south, the vineyard is one of the southern most vineyards in the world, along with a select group of other vineyards on the Earnscleugh Rim. At Grasshopper Rock, the passion for the people who make Pinot Noir is to achieve excellence, working with the best raw materials and managing them to the best of their ability. Grasshopper Rock is a unique combination of land, climate, vines and people. The five shareholding families of Grasshopper Rock live throughout the country, from Hamilton to Invercargill. The families originally met through a common interest in agriculture, with four members involved in rural banking. Today, these interests have diversified into banking and finance, dairy farming, sheep and beef farming, pharmacy, fine arts and white baiting. All share an interest in New Zealand wine and food, and annual meetings held at Wanaka are always a celebration of the best of local produce, including their outstanding Pinot Noir. 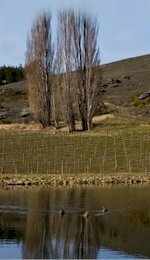 he vineyard takes it name from a rare grasshopper, Sigaus childi, which is found only in Central Otago, and predominantly on the Earnscleugh gold tailings, which lie along the Clutha River, across the road from the vineyard. And the Rock alludes to the gold that is no longer in the tailings, and probably never was. The new gold is wine, and Grasshopper Rock hope that you will find a little bit of gold in the pleasure you get from their wine.